IS THERADOME LASER HAIR GROWTH ONLY FOR WOMEN? “Is Theradome only for women?” This is a question we hear all the time, so we want to put this myth to rest once and for all! Theradome is, in fact, FDA cleared for both women and men! Additionally, the Theradome LH80 PRO is recommended by 4 out of 5 hair loss experts in thousands of clinics and is used worldwide by both men and women. As an OTC device, both men and women can purchase the Theradome helmet. The reason for this common misconception is that Theradome was first FDA cleared for women in 2012. We were thrilled to announce that it received FDA clearance for men in April 2018. However, you might still be wondering, why was it cleared for women first? Here are a few reasons we chose to seek FDA clearance for women first. 1) Hair loss in men is more socially acceptable. According to the American Hair Loss Association, only about 40% of people struggling with hair loss are women. However, 100% of women with hair loss will do something about it while only 5% of men will seek treatment. That’s because it’s a lot more socially acceptable for men to lose hair than women. Hair loss for women is especially devastating, as thick, lustrous hair is often associated with femininity and beauty. Yes, it’s a double standard. Don’t believe us? Take a look around. Chief executing officers happily carry on growing their businesses as their hairlines recede and actors in Hollywood still get offered starring roles, whether with or without the help of few hair fibers or toupees. Ironically, women are also more likely to suffer from hair loss due to fashionable hair styling trends. These trendy styles may require harsh chemical alterations or adding weight to their own hair. Don’t forget that ladies are also more prone to hormone fluctuations, which can directly interfere with hair thickness and volume. Pregnancy causes hair loss for many women as energy is directed toward developing a healthy fetus. 2) Men still have more hair loss treatment options than women. Due to all of the above, you’d think that the hair loss market would have picked women as their primary clientele, but this is actually not the case. There are still more options for men when it comes to reversing hair loss. Finasteride, for instance, is a prescription drug only intended for men. Hair transplantation surgery is another great example: while women with advanced stages of hair loss can also benefit from surgery, this procedure is much more commonly performed on men. Why? Simply that male pattern baldness differs from women’s in a way that it becomes easier to “fill in the voids”, no pun intended. That, and some men may also experience smooth “scalp shine”, which indicates that hair follicles are now buried underneath a layer of skin. In this case, only a combination of hair restoration surgery and laser hair therapy can help achieve a full head of hair again. 3) Women are still often told to deal with hair loss. The sad thing is, many physicians tell women that thinning hair is simply a part of life. That they should simply get used to it and move on. Many women resign themselves to wearing wigs, scarves or covering up problem areas with fill in powder. The irony is that hair loss often leads to emotional and psychological distress, which can itself greatly affect your health. After all, we’ve all heard of the saying, Happy Mind Happy Body. Plus, while hair loss isn’t inherently dangerous, it’s often the result of an underlying health condition. 4) The Theradome is clinically proven to thicken hair. With an optimal dosage of energy, a scientifically engineered Low-Level Laser Light Therapy (LLLT) device is proven to minimize shedding, generate new hair growth and thicken hair shaft diameter. Thick, voluminous hair is a benefit that usually appeals even more to women than men. Not to mention that with its ability to tweak the hair growth cycle and elongate the growth phase, Theradome can also prevent hair loss before it even occurs. 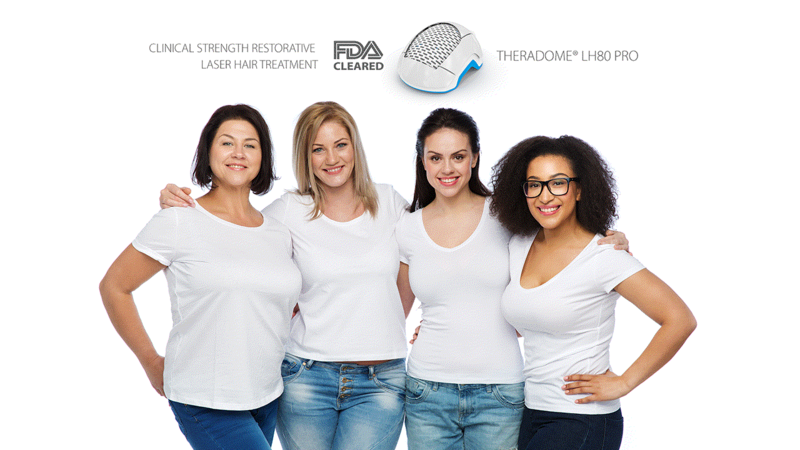 Theradome® has been a game changer in the field of hair restoration for women. In a way, gifting them with the most powerful OTC FDA-cleared LLLT device makes up for a lack of effective, safe hair restoration options in the past few decades. No woman should ever have to go through life without hair or be forced to contemplate unsafe treatment options that are not designed for the female body. And no woman suffering from hair loss should ever be told to accept it as a part of life. We hope that clears things up and puts to rest the question “Is Theradome only for women?” And we also hope you understand why, this time, we put the ladies first.